Many local companies are adopting mergers and acquisitions and various strategic alliances for strengthening their position in the global concrete block and brick manufacturing market. The stiff competition in the market is turning to a high level competition due to the activity of larger companies who are concentrating on alliances to penetrate deeper into regional markets. These uppermost players in the global concrete block and brick manufacturing market outshine their rivals among themselves through constant product innovation along with cutting down product prices. Many startup companies in the market are focusing on attracting new consumers to their businesses to steal a march over competitors. According to experts from TMR, the global concrete block and brick manufacturing market is expected to gain value of US$2769.24 bn by the end of 2027. The market was valued US$1,837.48 bn in 2016. Experts project this growth to occur at a promising CAGR of 3.8% during the forecast period from 2017 to 2027. 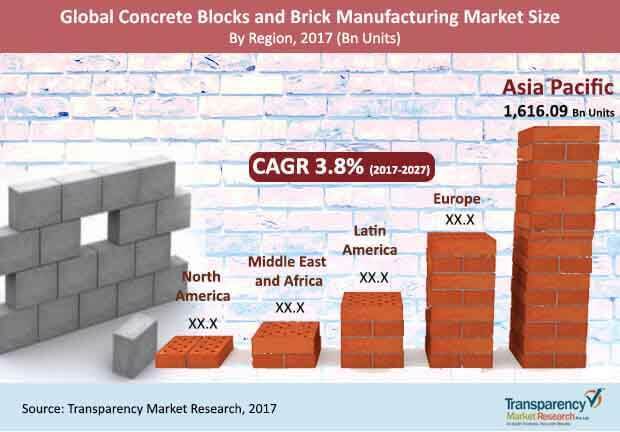 Among various types of products in the market, the brick segment is expected to register the highest growth and boost the global concrete block and brick manufacturing market during the forecast period. This is because of the rising number of construction projects worldwide and growing need for cost-effective and easily available construction materials. With respect to geography, Asia Pacific is expected to dominate the global concrete block and brick manufacturing market in the coming years. This is attributed to the rapid growth in the construction industry and burgeoning population in the region. Concrete block and bricks are the rectangular stone-like structures which are mainly used for building the walls of several structures include houses, apartments, and various others commercial constructions. Such block and bricks play a crucial role in the construction industry. Concrete block and bricks exhibit efficient properties such as cost-effective insulating facility for electrical units, thermal insulation, fire resistance, and great durability. Such amazing properties along with their excellent reliable and sustainable qualities makes them unique and stand out other conventional alternative materials. Such USPs are majorly driving the global concrete block and brick manufacturing market. Furthermore, rising focus on revamping the existing infrastructure and growing investments in residential construction are also fueling growth in the global concrete block and brick manufacturing market. Along with this, rapid urbanization across developing economies and increasing foreign investments in construction and building manufacturing sectors are also bearing lucrative opportunities for market players, which in turn is also propelling expansion in the global concrete block and brick manufacturing market. Advent of advanced concrete materials and growing adoption of eco-friendly building materials are the biggest challenges in the global concrete block and brick manufacturing market. Nonetheless, persistent demand for cellular blocks and hollow blocks from building and construction industry is believed to help overcome some of these challenges in the near future. The review is based on a market research report by TMR, titled, “Concrete Block and Brick Manufacturing Market (Product Type - Concrete Block (Hollow, Cellular, and Fully solid), Brick (Clay, Sand lime, and Fly ash clay), and ACC Block - Global Industry Analysis, Size, Share, Growth, Trends, and Forecast 2017 - 2027”.